Lyme, New Hampshire real estate consists of single family homes, condos, and land. 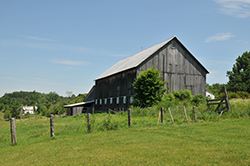 Types of homes range from farmhouses to Capes and contemporary saltboxes. Lyme is a quaint small town located along the Connecticut River with more gravel roads than paved ones. The rolling hills and stretching pastures give the historic homes of Lyme a picturesque backdrop. Beach offers residents summertime fun while The Dartmouth Skiway offers skiing in the winter and hiking throughout the year. To learn more about Lyme, click here! Scroll down to find all current Upper Valley real estate for sale in Lyme, NH. Contact us if you have questions or would like to learn more about a listing. Sign up to save your favorite listings and email updates when similar listings hit the market. Let the sun shine in.... Experience the peace and quiet of this charming Contemporary in a Lyme country neighborhood. Each hour of the day, light streams across the wraparound deck and into the glass front of each of its welcoming living spaces. In its perfect simplicity, the open plan brings warmth, functionality, and ease of maintenance to its design. Whether gathering around the kitchen island, or warming by the wood stove, you can dine, entertain, or just spend time relaxing on the cheerful main level and then retire to a a second level with two ample bedrooms of your choice. A lower level walkout recreation/exercise room again takes advantage of the solar influence. Come to Lyme country! Seasonal waterfront cottage in terrific condition on beautiful Post Pond in Lyme, NH! Lovely screened porch and decks to enjoy fishing or watching the loons swim by. Relax, recharge, and reconnect with your favorite peeps. Build lasting memories kayaking, stargazing, and campfire making. Low energy vs abundant recreational activities of the White and Green Mountains ~ your biggest decision. Convenient to Upper Valley destinations, shopping, and hiking. Award-winning Dresden School District. You will need a boat to access this little piece of paradise! Versitile Property in the center of Lyme Center. Currently used as a three unit with a lovely 2 bedroom apartment on the second floor. First floor office space with main office area plus three additional offices with air conditioning. The third unit is the Post Office. Sited on .59 acres with rear yard for private use, gardening etc. Idea for in home business with living space above. This is an unusual offering and worth a look! CLOVERTOP- One of the most elegant properties in the area, Clovertop is perched in an idyllic setting with 270 degree panoramic views. There are actually 3 different view corridors carefully sited from different areas of the house and grounds. The main view to the south over Post Pond is simply breathtaking. The house was constructed by a highly respected local luxury builder. The interiors are bright and spacious with large gathering areas for family and friends, and other more intimate spaces like the library and sunroom to enjoy the serenity. The current owners added a beautiful great room that is warmly lined with cherry built-ins. Above it is an exceptional, private master suite with cathedral ceilings, large master bath, cozy sitting area and generous walk-in closets. There are 4 bedrooms total in the house all en suite, including one on the ground floor. The landscaped gardens are lined with numerous well crafted stone walls. Clovertop abuts the Lyme Town Forest and there are trails on the property that connect to larger systems that allow you to go for miles. The wildlife is abundant. The house is two miles to the Post Pond recreation area with a pond, beach, tennis courts, playing fields and boat/canoe launch. Clovertop is in a prestigious area of Lyme, minutes from the village and a short distance to Hanover, NH, home of Dartmouth College. Fabulous 19th century farmhouse on 103+/-ac property with river frontage. 4 bedrooms, 3.5 baths. Completely renovated by a master craftsman in 2001, with new septic, radiant heat, new wiring, new plumbing and drilled well. Land in conservation. River bank deck and steps to potential permitted dock. Outstanding value in quiet setting in the lovely village of Lyme. "Clay Brook Place" - this beautifully renovated 1800's farmhouse is spacious, light-filled, and has a wonderfully designed floor plan. The open-concept first floor has a modern kitchen, generous in size, which opens to living and dining spaces - ideal for entertaining. In the colder months, spend evenings around the Rumford Fireplace with a glass of wine or early mornings with a cup of coffee and a good book. The master suite provides a large bathroom with a claw foot tub and his and her walk-in closets. There is an additional "wing" that offers two bedrooms, a 3/4 bath and a second story office or recreation/media room. The hand-hewn beams and wide pine floors add to the integrity of this historic home. There is no shortage of storage space - there are large closets throughout the house - even under each staircase! The oversized barn currently houses a fully finished area with a cozy gas stove - ideal for a home office, recreational room or guest space. The stone patio and seasonal perennials make outdoor entertainment in the warmer months an absolute delight. There is a backup generator and a secondary pellet furnace in addition to the primary. Sited perfectly, the home is set back from Orford Road just enough to provide the right amount of privacy yet extremely convenient to both Lyme and Hanover - 3 minutes to to the Lyme green and 18 minutes to Hanover. Lyme has its own elementary/middle school and choice for high school. Nestled high up at the end of a lovely country lane, this New England Contemporary is Move-in Ready!! This nicely maintained home features bright and versatile living spaces, a newly renovated kitchen, updated systems, and plenty of room for family, guests and entertaining! A more recent addition is an impressive and spacious open concept guest or in-law apartment with separate entry and utilities ... A home in itself, with great income potential. Add to this package, a 3 car attached garage, a tractor barn/studio , charming outbuildings, and numerous useful "features"! The setting is peaceful and private, with dramatic views of the surrounding mountains and hillside. The location is surprisingly convenient...just minutes to the Lyme Green and an easy commute to DHMC, Dartmouth and Upper Valley amenities. An opportunity to experience all that the great community of Lyme has to offer! Feast your eyes on this exquisite property in the middle of the Lyme action! The most fine blend of old and new, this house has been thoughtful renovated inch by inch. Downstairs features a great room with living/dining/kitchen making your nights at home and entertaining flawless. Separate living room with wood stove insert for your cozy gatherings. Upstairs, a gorgeous master suite with cathedral ceilings, many windows, walk in closet and huge bathroom. Other features include movie room with state of the art equipment in the lower level, 1.4 acre yard with patio and fire pit and a deep water pond for swimming or skating. Energy efficient with tons of insulation, solar panels and a unique Ground Source Heat Pump heating system. Steps from Lyme School, Library, Hardware Store, Post Office and Restaurants! The best of old and new with this lovely ground floor condo with 2 car detached garage with storage above. Original features include wide pine floors, hand hewn beams, raised panel and beautiful solid doors. This sunny condo is on the ground floor of the entire building so you enjoy light from all four directions. Master suite is on one end of the unit and two bedrooms with a full shared bath on the opposite side. The dining room and library each have a fireplace. New appliances, cherry kitchen , with views out to babbling Hewes Brook. The Village condos are close to both Lyme, the Dartmouth Skiway, restaurants, yet only minutes to Hanover and campus. Charmingly renovated 1835 three bedroom, two bathroom farmhouse on 1.71 acres. Great location offering both in-town convenience and country tranquility. A short walk to Lyme village with the post office, banks, hardware store and the Lyme Country Store. Easy access to hiking and biking trails. Enjoy your morning coffee on the covered porch facing the large back yard and listen to the gentle burble of the brook that runs through the property. A charming house in a great location!